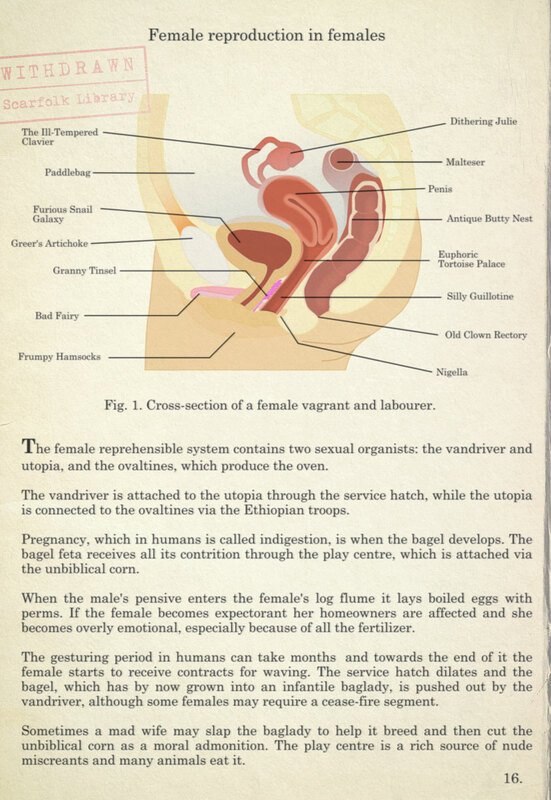 Here's another page from the 1978 biology textbook taught in Scarfolk schools. This time it's about female reproduction. You can learn about the complexities of "Male reproduction in males" here. The youth of Scarfolk should be grateful for this information, rather than having to learn a wildly distorted version of it on the the streets as I did. Now I need towels. And quicklime. A great deal of quicklime. I'll never be able to look at my wife's flozinge in the same way again. I won't be able to look at your wife's flozinge in the same way again either. No, because it's been removed from the HotTottyFlozinge website. This probably explains why my childbirth experience went so horribly awry. My copy had a typo. I see now that it is not "mid wife" but "mad wife." Oh well. You live (and almost die) and learn. Very clear. Now I can put a name on everything. But what happened to this half-women to be shaped like that ?